It’s a funny beginning because 20 years is a long time for a company to establish a record for being consistently profitable. Nevertheless, Amazon grew revenues and destroyed other people’s businesses as it was making money sometimes and more often losing it. Today, Amazon has the reverse problem: It gushes cash but has become an inconsistent grower—at least compared to its own high-octane days. Slower-than-hoped-for growth coupled with less-than-enthusiastic guidance combined to cream Amazon’s stock in after-hours trading. 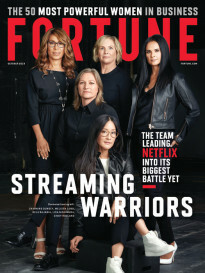 Amazon is a juggernaut still. But it hasn’t found a growth elixir for the pricey supermarket chain it acquired, Whole Foods. Its web hosting business has real competition. And its belated commitment to paying higher hourly wages will cut into now-reliable profits. 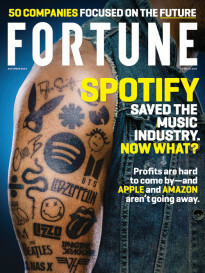 Speaking of Amazon, I highly recommend a feature story in the current issue of Fortune by Brian Dumaine about the voice-computing efforts of Amazon and several of its competitors. This is a fascinating dissection about how artificial intelligence is juicing the ability of computers to recognize human commands and respond with useful information or actions. Dumaine makes the case that this computing paradigm shift is so important it could be as big as the shift from PCs to smartphones. I think you’ll find the article worthwhile. Have a paradigm shifting weekend. Jaw dropper. Adam mentioned Amazon’s disappointing earnings, but Jeff Bezos & Co. were not alone in underwhelming investors. Google parent Alphabet said revenue increased 21% to $33.7 billion, less than Wall Street expected, and earnings per share of $13.06 were bolstered by a large one-time gain on investments. Google is also feeling the impact of a New York Times investigation that found the company sent several top executives (including Android founder Andy Rubin) off with lucrative exit packages after they were accused of sexual misconduct. Though filled with stunning details, Rubin said the story was false and Google CEO Sundar Pichai shot back in an email to employees saying 48 people, including 13 senior managers, had been fired for sexual harassment over the past two years. In premarket trading on Friday, Google shares were down 6%, which puts them in negative territory for the year. Filling holes. Despite the hardships of quarterly reporting, more tech companies still want to go public. Airbnb, heading for an IPO possibly next year, hired former Google vice president of engineering Aristotle “Ari” Balogh as its chief technology officer. The startup is still searching for a new chief financial officer, however. All you’ve got to do is blow your nose and it’s fixed. Consumers were winners in the triannual determination of permissible exceptions to digital rights management, or DRM, technology. The Librarian of Congress and U.S. Copyright Office said consumers and repair shops should be allowed to bypass DRM in smartphones, cars, tractors, and other devices needing to be fixed. On your marks. The Trump administration issued a presidential memorandum on Thursday in an effort to accelerate the transition to 5G wireless networks. “It is imperative that America be first in fifth-generation (5G) wireless technologies,” the memo notes. The administration’s 5G race metaphor has already been taken up by the industry, which used it to convince the White House to block Broadcom’s acquisition of Qualcomm. Expect to hear a lot about 5G when the administration approves T-Mobile’s merger with Sprint, too. In Atlanta and other racially segregated cities, the education system is stacked against African Americans competing for STEM careers. If Amazon picks the city for its second headquarters, things could get even worse. He’s sold 150 million albums and been famous for five decades. But do we really know Elton John? “I would not have chosen to move on at that particular moment, but you have to separate the emotion from the logic,” Mr. Hunt said in an interview. Now CEO of health tech startup Curai, he added that he had a months long, amicable transition. The good folks behind the Merriam-Webster dictionary have a new way to amuse you. The company’s Time Traveler web site lets you see what year words and phrases were first used in print, going back centuries. Here are some words debuting from the year I was born: acidhead, druggie, foosball, head shop, narc, street smarts, unisex, and zit. Weren’t the 1960s grand?